"It will be like a whole new store." Located at 1525 Wilson Blvd. in Upper Rosslyn, Safeway is in the midst of a significant renovation that should be completed by April if all goes as planned. Store Director Ron Hill says several improvements have already been made: Self check-outs have been added at the front of the store and well-worn floor tile has been replaced by a concrete surface that is buffed to a glossy shine. In addition, grocery aisles have been widened and shelves raised to provide more space for a greater variety of products. At the moment, Hill said they are installing brand new frozen-food cases. "We want to make everything as convenient as possible for our customers," he said. In the coming months, Hill said they will expand the bakery and add a seafood department, which the store currently does not have. Also, the Starbucks counter within the store will be expanded and moved to the front. "A lot of our customers seem excited about the changes taking place," Hill said. "It's going to be like a brand-new store." 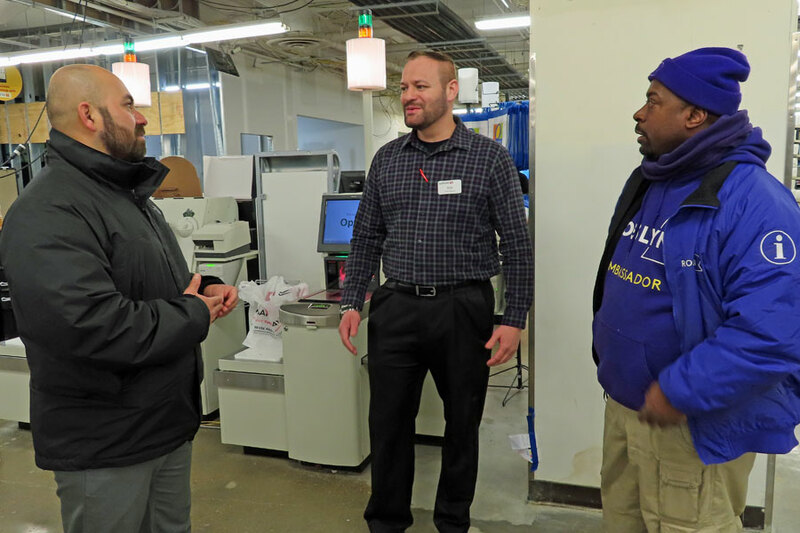 Rosslyn Safeway Store Director Ron Hill talks with the Rosslyn BID's Operations Director Victor Carcamo and Ambassador Keith Dixon about renovations currently being made at the store.